"I have come to Jaffna today to see first hand the devastation wrought by the long and tragic conflict, and to gain better understanding of the ground realities," said Canadian Foreign Minister Mr. Bill Graham, addressing a press conference Thursday at the UNHCR office in Jaffna. "Canada's major foreign policy objective with regards to Sri Lanka is to promote a permanent political settlement of the conflict between the government and the Liberation Tigers of Tamil Eelam (LTTE)," said Mr. Graham. Canadian foreign minister Mr.Bill Graham addressing press conference at the UNHCR office in Jaffna. He said that he met with the Security Forces commander and leaders from "a broad section of civil society--people who have lived in the region throughout the conflict, and who are dedicated to assisting the population rebuild shattered lives." "In my meeting with the military commander, I discussed the complex military situation in the High Security Zones. The government is now working on this issue. They have some security concerns regarding resettlement in high security zones," said Mr. Graham in reply to a question. "I have come to Sri Lanka at this critical juncture in the peace process to underline Canada's strong and continued support for peace," said the Canadian Minister, adding that a "negotiated settlement is the only way to secure lasting peace. A negotiated settlement must satisfy the legitimate aspirations of all Sri Lankans regardless of language, ethnicity or religion." He commended the Government of Sri Lanka and the LTTE for their important agreement to explore a solution based on a federal structure. "Canada has long experience with federalism. We have learned how peoples of diverse language, ethnicity and religion can live and prosper together. I believe that some form of federalism, tailored to Sri Lanka's unique circumstances, offers the most viable political solution. For the past year, the Canada-based Forum of Federations has been sharing knowledge and expertise on federal options with all parties to the peace process. The Government of Canada has been funding this work, and I am pleased to announce today that Canada will continue such support, as long as the parties find it useful," said Mr. Graham. "The LTTE must actively re-engage in peace talks, and once back at the table, stay the course," he stressed. He added that the legitimate aspirations of the Tamils--indeed all Sri Lankans-- to live in peace and dignity would only be served by a negotiated settlement. Mr. Graham continued: "The ceasefire has held for 20 months. Despite the many obstacles, there has not been a better opportunity in general to achieve lasting peace. Canada will continue to support efforts to end the violence and conflict that has devastated this country and its people, and to work with Sri Lankans of goodwill towards a peaceful and prosperous future. "While this is my first visit to Sri Lanka, I have closely followed Sri Lankan developments for many years. Many of my own constituents came to Canada during the conflict years and events in this country are important to me, and to all Canadians who cherish peace and democracy. 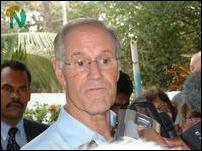 "Canada has a direct interest in the peaceful resolution of conflict in Sri Lanka. The conflict here has had a direct impact on Canadian society. More than 200,000 people of Sri Lankan origin now call Canada their home. We have welcomed them and they have enriched our society. There are now close ties of family, friendship and business between our two countries."